It is said a butterfly effect is enough to start a chain of events, something similar was happening in Tibet. The most harmless-sounding term, Invitation was given to his holiness the 14th Dalai Lama of Tibet by the Chinese general. It was an offer to come and enjoy the performance by a dance troop without any kind of bodyguard or military officials in Chinese’s military base. Sounds suspicious! Prior to this delightful invite, Tibetan rebels and China soldiers were engaged in a guerrilla war for few years. This friendly invitation had many alternative motives behind it, on the day of the performance thousands of protestors surrounded the Dalai Lama’s palace in Lhasa to keep him from being abducted, arrested or worst killed. This uprising increased for many days, His holiness’s advisor urged him to flee. Today, March 17, in 1956, the spiritual and political leader of Tibet around the age of 23, disguised himself as a soldier and slipped through the crowds to never be seen in Tibet again. He commenced on a dangerous journey to reach India down sound, his advisor and soldiers following him. He crossed the great Himalayas on foot and travelled in the night to remain undetected. This whole journey took two weeks and for two weeks world fears that he was killed. This troop’s destination was India and to reach it, they had to cross Brahmaputra River. On 30th March these groups of travellers crossed the Khenzimana pass and entered India. India gave free passage to this peaceful leader and helped settle him and his follower in Dharamsala. Dalai Lama established his government in exile in this place and called it Little Lhasa. Around 80,000 Tibetans followed their leader into exiles. It was a movement of pain and relief, they escape the clutch of Chinese but lost their motherland. 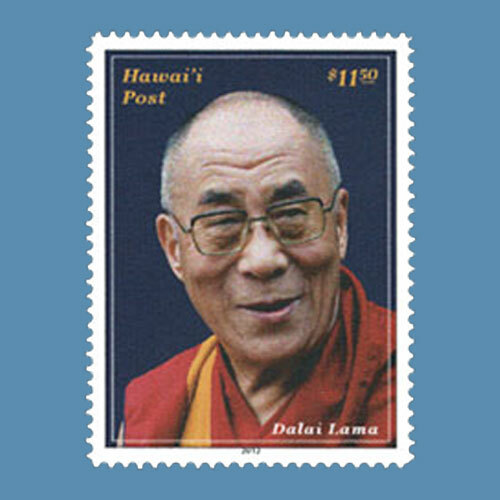 The above-shown stamp was issued by Hawai’i in April 2012 to commemorate his holiness’s visit. This stamp depicts the 14th Dalai Lams’s portrait in his traditional attire. To know more about His holiness the 14th Dalai Lama click here.